Wave petunias are a type of spreading or trailing petunia that bloom heavily and profusely. Wave petunias come in a vast array of flower colors and are extremely easy to grow. These annual flowers can spread as much as 4 feet, but grow fairly low to the ground. They have the typical trumpet-shaped flowers like other petunias and can be easily grown in containers or in the ground during the warm season months. First widely introduced in 1995, wave petunias are engineered hybrids of a species found growing wild in Brazil. Water your wave petunia deeply and thoroughly once every seven to 10 days when rainfall is less than 2 inches. Provide water directly to the soil to soak the entire root area. Feed your wave petunia once each month with a balanced liquid flower fertilizer. Follow the directions on the fertilizer label for dosage. Deadhead your wave petunia to remove all old, faded and dying flowers. Pick off the faded flowers, allowing the stems and stem tips to remain. Deadheading will keep the petunia looking neat and encourage healthy blooming. Prune your wave petunia’s shoots back to half their length if the plant stops flowering early in the season or begins to look “leggy.” Apply an additional fertilizer dose and water the petunia well to encourage re-blooming and best growth. You can plant your wave petunia in the ground outdoors in a flower bed or in a container. 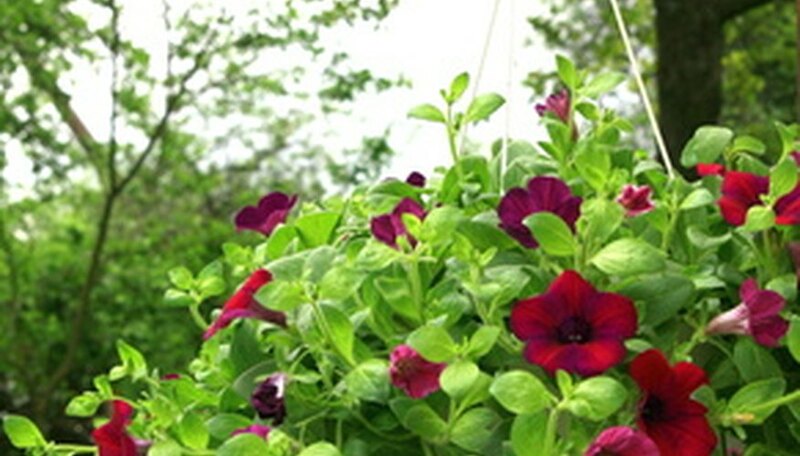 Due to their cascading, spreading growth habit, wave petunias often look best in a hanging basket or window box. Grow the wave petunias in full, direct sunlight. Beware of fungal diseases infecting your wave petunias. You can prevent most fungal diseases by watering directly into the soil so you don't wet the flowers and foliage when watering.